Lt. Governor Boyd K. Rutherford joined state and local leaders to announce new Hogan administration initiatives to expand substance use prevention and treatment efforts, as well as a new executive order to study mental and behavioral health in Maryland, with a special emphasis on the correlation between mental illness and substance use disorders. The lieutenant governor spoke at a press conference hosted at Helping Up Mission in East Baltimore, and was joined by Secretary Bobby Neall of the Maryland Department of Health (MDH), Executive Director Steve Schuh of the Maryland Opioid Operational Command Center (OOCC), and CEO Robert Gehman of Helping Up Mission, as well as numerous other state and local officials and addiction advocates. In addition to the funding for substance use disorders and capital projects announced by Lt. Governor Rutherford, Schuh announced $2.5 million in OOCC funding for the current fiscal year that will be used for additional community and local government prevention and education, enforcement, and treatment and recovery programs across the state. $35,400 for Carroll County Chamber of Commerce’s Drug and Violence Expo, which provides the community an opportunity to learn about the various issues plaguing the county, including the opioid epidemic, and the resources available to combat them. $10,000 for a Maryland Faith Health Network program that reaches out to the faith community statewide to reduce stigma and to educate citizens on the opioid crisis and resources available in their community. The event will include small group sessions for parents and caregivers who want to prevent their loved ones from addiction, for family members who have a loved one faced with substance use disorder, and support for those grieving the loss of a loved one due to addiction. $163,184 for Howard County Police Department’s Fight Against Heroin and Opioid Abuse through Analytical Testing Program, which helps close existing gaps in forensic testing services and fosters collaboration and cooperation among partner forensic laboratories and stakeholders throughout Maryland. $162,500 to expand the Heroin Coordinator Program statewide, which improves data analysis and information sharing between law enforcement agencies and local response partners to ensure a coordinated law enforcement and investigative strategy to battle the opioid epidemic. Heroin coordinators work with each jurisdiction’s Drug Task Force and partner with the federal High Intensity Drug Trafficking Areas (HIDTA) program in the dissemination of all drug-related intelligence. The coordinators also act as the local Opioid Intervention Team (OIT) point of contact on overdose trends, and manage the jurisdictions’ drug intelligence. $972,684 to repurpose the Poplar Hill facility in Wicomico County for substance use disorder treatment and recovery on the Eastern Shore. The facility will include 23-hour observation and detoxification services, residential treatment, and recovery housing, as well as an employment service — helping those in the recovery housing program successfully reintegrate back into the community and gain employment. $750,000 for Caroline Farming4Hunger Food Center in Caroline County, which will use a proven model that is already successfully operating in Calvert County. This model promotes job training for inmates incarcerated due to drug use and educates young people on the dangers of substance use. Students on field trips to the site will have the opportunity to speak with inmates in small group settings. They will learn about the choices the inmates made that led to their incarceration, and how they can make better decisions. $250,000 for Brooke’s House in Washington County, which was founded by Kevin and Dana Simmers after their 19-year-old daughter, Brooke, died of a heroin overdose. Brooke’s dream was to provide a long-term sober living facility for women. Her father promised her the house if she stayed sober for one year, but Brooke passed away before she was able to reach that one year of sobriety. Her parents now are going to deliver on this promise with the help of the state and their community. $80,922 for Horizon Goodwill Industries PROJECT REALIZE! in Washington County, which will support its mentoring program for youth involved in the justice system. $75,310 for CrossRoads Freedom Center Addiction Wellness Program in Frederick County, which helps to reduce existing gaps in services and foster collaboration and cooperation. Crossroads will enhance traditional recovery practices by integrating wellness therapies to support emotional, psychological, and physical health outcomes in clients. Before It’s Too Late is the state’s effort to bring awareness to this epidemic—and to mobilize resources for effective prevention, treatment, and recovery. 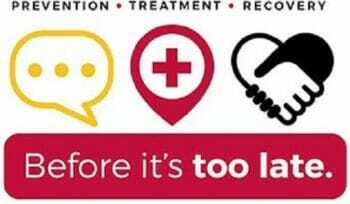 Marylanders grappling with a substance use disorder can find help at BeforeItsTooLateMD.org or by calling 211 and pressing 1.